I love the hot sun, the lazy days, and the cool water of the pool or beach. I am getting so anxious for the pool to open! While trying to schedule activities at a meeting for church last night, I realized that our summer is already jam packed with travels and other activities.﻿ I am SO looking forward to everything that we have planned, but what about those days with nothing to do? I've always had a hard time trying to come up with fun activities to do with Ande on those days where it is just too hot to leave the house. Luckily, there are other people out there who DO have great ideas! The blog, Gluesticks, has created a summer long link party dedicated to fun summer activities for kids. Here is the link for her post. She has already posted over 20 ideas of her own from the past couple years, and has invited anyone to come and link up with their creative activities. I went ahead and linked up my Airplane Fun Tray Cover that I made last year for our flight out to Utah. It slips right on to the tray on the back of the seat. I tried to include activities that keep a little 15 month old (at the time) occupied. 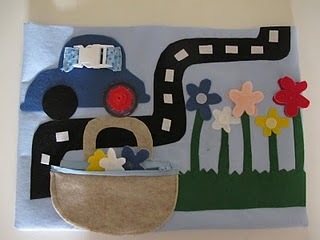 It had a buckle, velcro, color matching, a zipper, and a little road for driving cars. It worked out well for us. So far, the link party over at Gluesticks has offered fun foods to cook, play dough recipes, flip flop decorating, I-spy bags, and more. If you are looking for some creative activities for your kids, make sure you check it out!